Business on-the-go. Lenovo blows its own horn and even speaks of a "legend" in connection with the ThinkPad X1 Carbon in which 20 years of development have been invested. Regardless of any sympathies, very interesting key specs remain: 1.3 kilograms (2.87 pounds), a bright 14-inch screen, and full business compatibility. Is that enough to become a legend? After our colleagues in the US office scrutinized the X1 Carbon premium model (i7-3667U processor, 256 GB SSD) designed for the American market, we want to dedicate ourselves to a model made for the German market in another test. Featuring Intel's i5-3427U CPU and a 128 GB SSD, it does not let us expect any speed losses, but it does seem more attractive with a price of approximately 1450 Euros (~$1874). 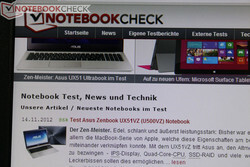 Our test device is a retail version which comes to us directly from the German online shop Notebooksandmore.de. Update: The configuration (N3N34GE) that we reviewed here was sold out after we concluded our tests and is currently not available. We want to analyze whether there are differences compared with the US test model and particularly whether both models vary in terms of performance, emissions and battery runtime in the following review. It is a ... ThinkPad! 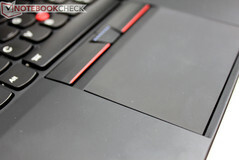 Lenovo gives the new ThinkPad X1 the byname "Carbon", but the high-tech material remains unseen to the user. The only thing that indicates a special choice of materials is the low weight. We measured exactly 1347 grams (~2.87 pounds) for the present test device. Fujitsu's U772 exhibited a similar weight of 1.4 kilograms (~3.09 pounds) and also included a 45 Wh battery. The stability of the ThinkPad Carbon X1 and LifeBook U772 is identical. The X1's base unit is rigid and the approximately 6 mm (~0.24 inches) thick, carbon fiber reinforced display can be warped with moderate force. Selective pressure hardly induces dents on the lid's back; only extremely high pressure provokes image changes. Marginal deformations can also be induced on the magnesium base unit this way. Nevertheless, the ThinkPad X1 is on an overall high standard in terms of stability and workmanship, and is only outperformed by unibody designs like found in Asus' UX31A (13.3-inches, 1.4 kilograms). HP now also offers a business ultrabook. The EliteBook 9470m (review coming soon) also uses a 14-inch screen at a weight of 1.63 kilograms (~3.59 pounds) (manufacturer's specification, 52 Wh battery). Dell does not yet have a directly comparable business ultrabook in its range (Latitude 6430u in production - 1.6 kg, 36 Wh), but it tries to cater to business customers with a higher mobility need by means of the Latitude E6430s (review coming soon). Dell states a minimum weight of 1.7 kilograms (~3.75 pounds) and the laptop is found with a 65 Wh battery in the online configurator. However, the minimum weight is likely only possible with the smallest available battery (32 Wh, manufacturer's specifications). The slim casing really limits the possibilities for installing numerous interfaces. It was ultimately only enough for two USB ports, one of which is a powered USB 2.0 and the other a high-speed USB 3.0 port. External monitors can be connected to a mini DisplayPort (2560x1600), but the necessary adapter is not included. 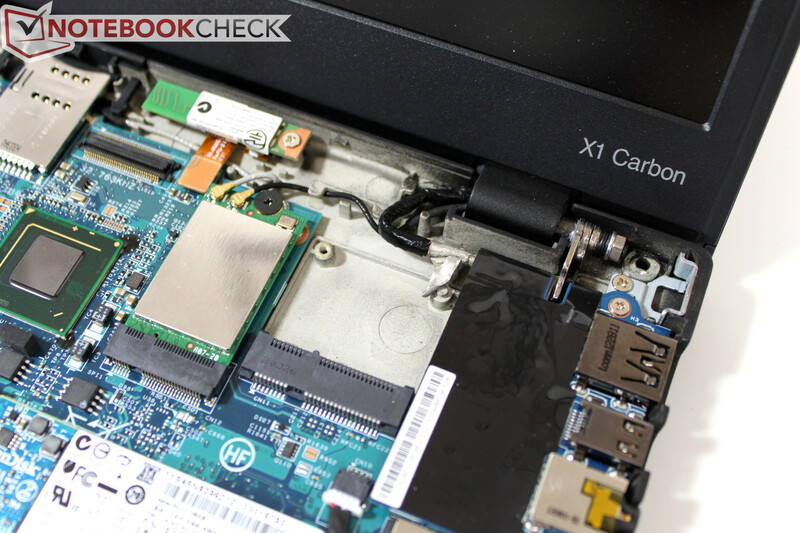 The X1 Carbon also lacks an Ethernet port. Lenovo only offers an optional USB 2.0 to Ethernet adapter (10/100) for around 19 Euros (~$25). The aforementioned potential contenders all feature three USB ports (2.0, 3.0, eSATA combo). The alternatives also offer docking solutions. This can only be retrofitted by connecting a USB 3.0 docking station to the Carbon X1. The contenders also seem to be superior in terms of cabled network connections. Fujitsu includes a matching adapter with Gigabit support for its U772; HP states Gigabit support for its latest 9470m and the first mock-ups of the device show an RJ45 port in the right, back area. Even Dell's E6430s sports an Ethernet port (RJ45, 10/100/1000) directly on the laptop. 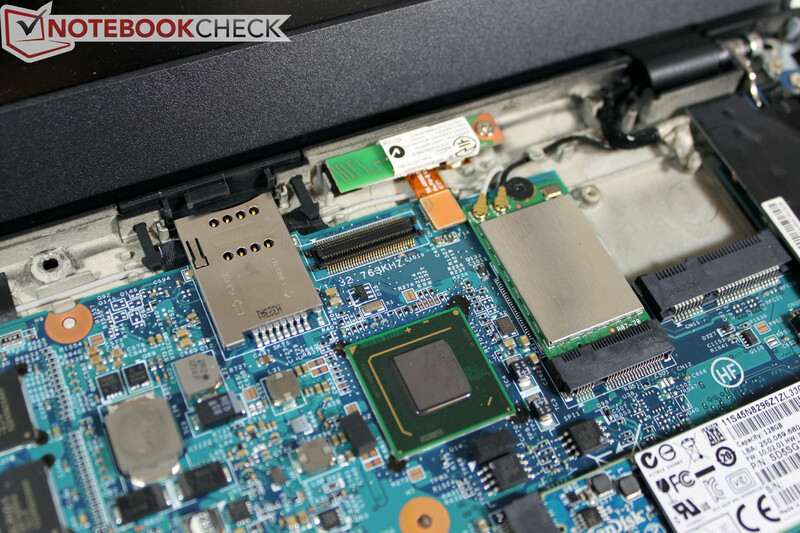 A Centrino 6205s module is employed in Lenovo's X1 Carbon. The technical specs correspond to that of the widely used 6205 (2x2 dual stream, 2.4/5 GHz band, 802.11 a/g/n, up to 300 Mbps, Intel WiDi, Intel AMT and vPro compatible). However, the 6205s is much smaller than its module colleague (not standard mini-half size, custom-built). 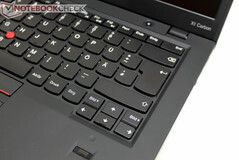 More details about the connectivity can be found in the review of Lenovo's Carbon X1. 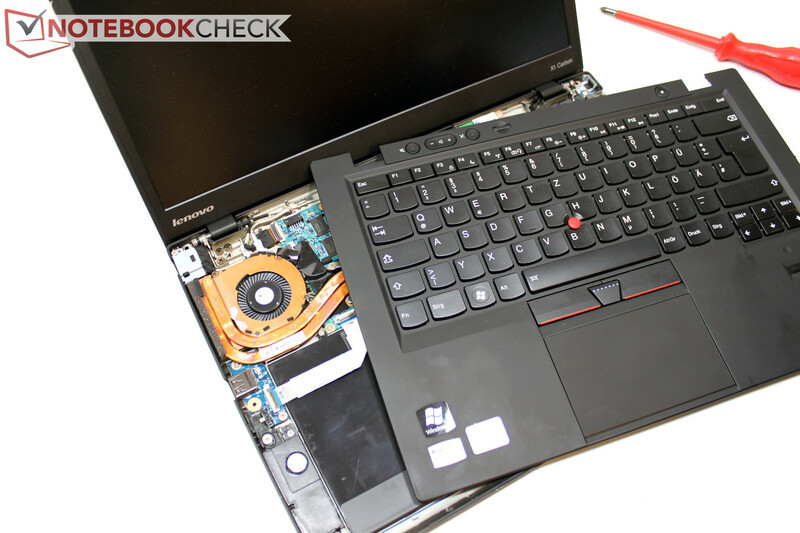 While many models from the ThinkPad range feature particularly easy maintenance and upgrade options, the X1 Carbon proves to be very closed. Opening the case should not be a problem even for inexperienced users when the instructions in the Hardware Maintenance Manual (link) are followed. But no significant upgrade options await the curious user. The CPU and RAM are soldered directly to the motherboard and the memory device is an SSD with a proprietary connector. Our test model did not feature a broadband module and consequently, the corresponding PCI Express half-mini slot was empty. It would theoretically be possible to retrofit a UMTS modem but according to the lender, the corresponding antennas would also have to be installed, which unlikely justifies the effort in practice. The top can be lifted after removing numerous screws on the bottom. Like the base, it is magnesium and reinforced with crossbars. The battery reserves most of the available room inside. The ThinkPad X1 Carbon sports a fan with a twin heat pipe. The RAM is soldered directly to the motherboard and cannot be upgraded. The Wi-Fi module is special size. Integrated broadband Internet is optionally available. 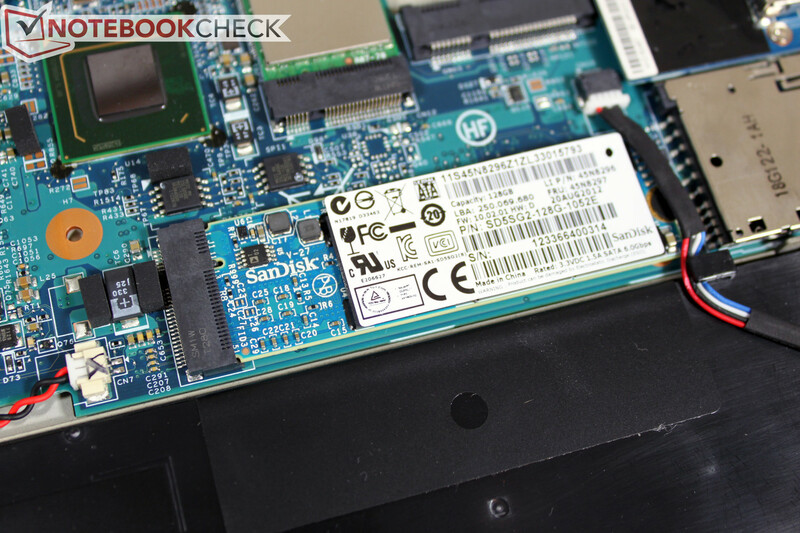 The SSD comes from SanDisk and has a capacity of 128 GB in our case. The ThinkPad X1 features a range of security features in order to fulfill the security needs in professional environments. Lenovo specifies an integrated TPM module, fingerprint reader, hard disk encrypting and Intel's Anti-Theft/Computrace as well as a USB and BIOS port lock in this context. Over 60 programs are listed in the control panel after initial booting. Lenovo's "SimpleTap" menu annoys with more or less important messages, but they can be reduced to some extent through detailed settings. Trial versions, such as Norton's Internet Security, are just as superfluous in a business laptop of this price range. The ThinkPad X1 Carbon models listed in German online shops all include a one-year on-site warranty. It is possible to upgrade to 5 years (ThinkPlus Service, plus 169 Euros/~$218), optionally with accidental damage protection (bumps, drops and spills). 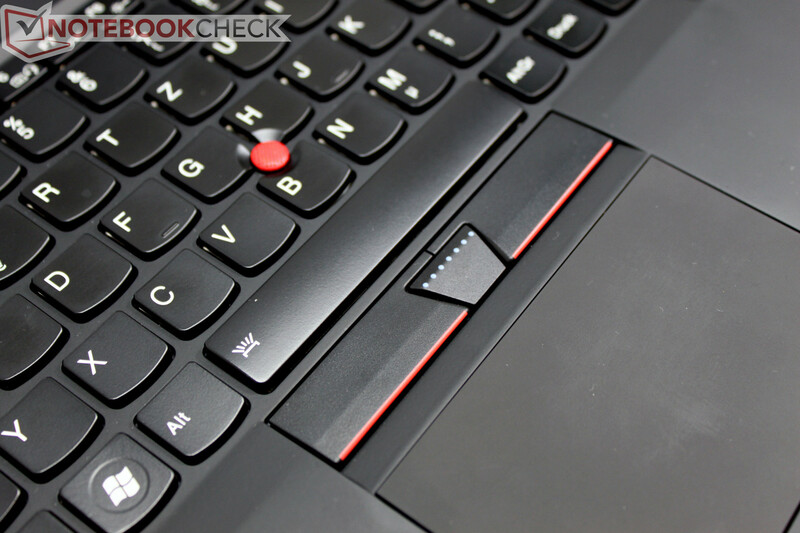 There have been a lot of discussions concerning the new chiclet keyboard in the latest ThinkPad models. 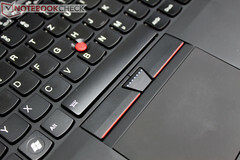 However, the familiar input is a good part of the ThinkPad identity and has accompanied loyal users for many years. We could alleviate doubts in our initial tests of corresponding ThinkPad models and can only repeat it for the present sample. 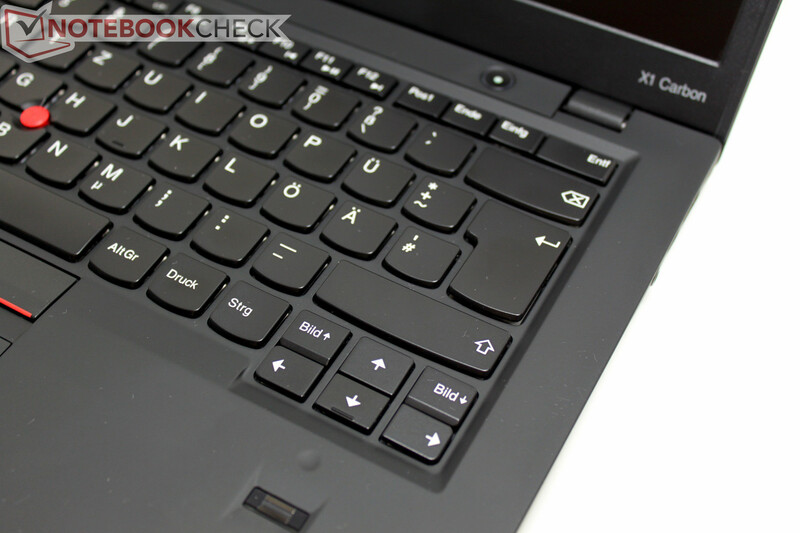 Typing on the keyboard is a pleasure and the typing feel only differs marginally compared to the well-known keyboard in the ThinkPad X220, which was used simultaneously in this test. A look underneath the keys reveals the same mechanisms as used for the familiar keys, excepting minor deviations. The new keys are even superior in terms of typing noise as they are quieter even when typing a bit more vigorously. The keys can be hit accurately due to their concave recess, the touch-typing marks are distinct and the typing feedback strikes with an especially clear pressure point and comfortable key drop. So, nothing new for old ThinkPad users, yet with the bonus of an integrated backlight (two brightness levels, off) that is superior to the old Thinklight in almost every regard. The touchpad is also impressive and shows improvement especially in size (101 x 61 millimeters/~4.0 x 2.4 inches) compared with the existing X230 devices. Multi-finger gestures, such as scrolling in documents, are smooth - which is also owing to the touchpad's pleasant, velvety surface. When using the option of a physical click (clickpad, no dedicated touchpad buttons) in the lower two-thirds, the cursor could shift a bit before the command is implemented because the click needs a bit too much force in the writer's opinion. It could help to use the pad with both hands. ThinkPad fanciers will use the familiar TrackPoint on the X1 Carbon, which is still the better mobile mouse replacement once its use has been learned. However, we would recommend using a high-quality, external mouse for precision tasks (e.g. CAD, graphic design, etc.) despite the two well-implemented mouse alternatives. Although it does not affect usage, we have to make a note about the workmanship. The touchpad in our test device was not perfectly centered in the base unit and protruded a bit over the wrist rest's left corner. This was neither the case in our US model nor in two other tested models and is therefore presumably a single case. 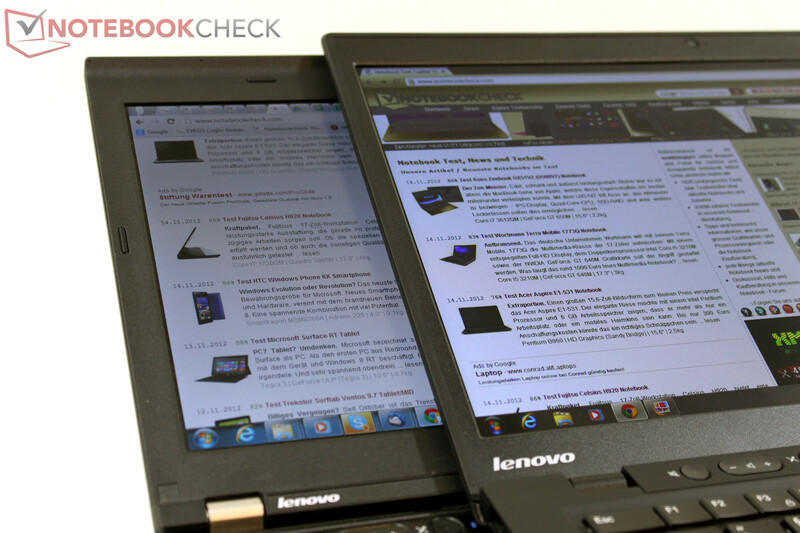 After the first review by our US editorial team (Lenovo press sample), we again check the screen of our retail model. Apart from minor deviations from the various measuring instruments, we can confirm the result of our first tests. The installed HD+ screen (model: LEN40A2, LG LP140WD2_TLE2) belongs to the paragons of its kind with a maximum brightness of approx. 300 cd/m² and a low black value of 0.46 cd/m² (contrast of ~650:1). Of the aforementioned contenders, we only have data from Fujitsu's U772, which demonstrates it biggest shortcoming here with a maximum of 200 cd/m² and a comparably low contrast. 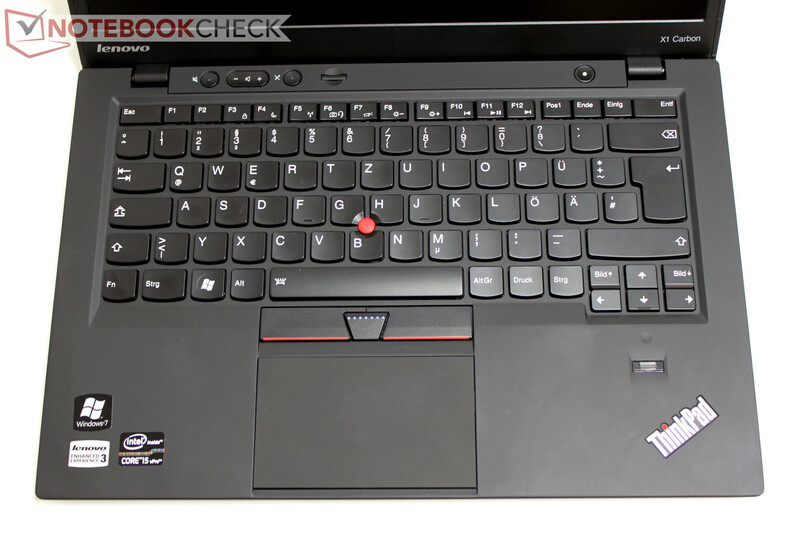 The ThinkPad Carbon X1 model that we tested comes with a resolution of 1600x900 pixels. Therewith, Lenovo's device places itself above both HP's 9470m (1366x768 pixels) and Fujitsu's LifeBook U772 which also sports an HD screen. Only Dell's upcoming Latitude 6430u will have HD or HD+ to choose from, according to first data. The X1 Carbon can gain a bonus point compared with the ThinkPad X230 here as well. 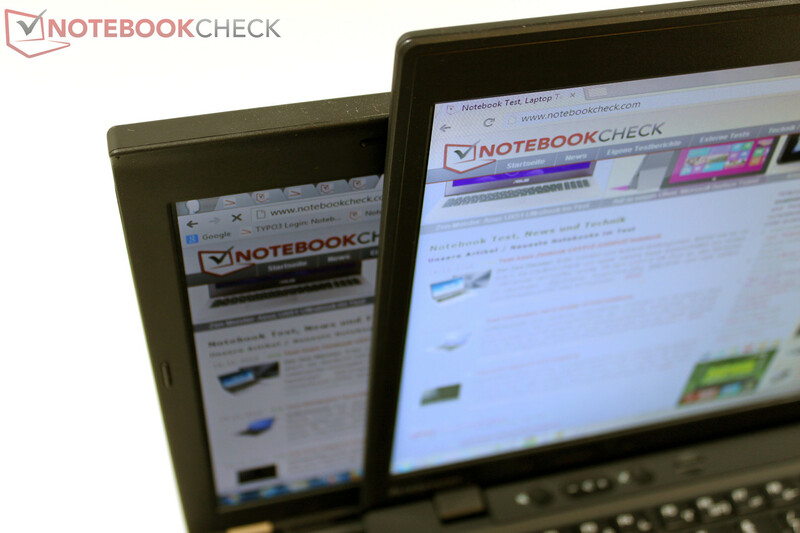 Its 12.5-inch IPS screen displays a maximum of 1366x768 pixels. Although this is adequate for the screen size, the X1 Carbon provides a better overview in mobile use without external monitors. According to the newest information from Lenovo, a ThinkPad X1 Carbon model featuring an IPS touchscreen and Windows 8 is to be launched on the market in the next months. However, we do not have more details about that yet. The bright screen enables a wide application field, no matter if on the desk at home, in artificial light at the office or in an unfavorably sunny seating position on the train - the screen in Lenovo's ThinkPad X1 Carbon copes perfectly with almost all conceivable situations. We did not observe flickering in color transitions and gray hues on different test pictures or in routine use as it was described in each test. We can however confirm the "screen door" effect described by forum users, but only at a viewing distance of approximately 30 centimeters from the screen. This grid on the screen is neither noticed nor annoying during normal use. We use an i1 Pro 2 photo spectrometer and CalMan 5 software for performing the color analysis on Lenovo's ThinkPad X1 Carbon. 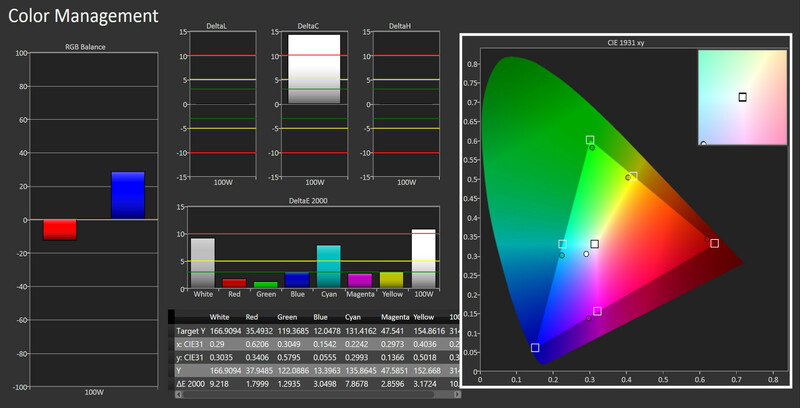 Measurements in the preset default color profile (TPMB72_1.icm) show a clear weakness in the reproduction of gray hues. Particularly light gray colors (from 60% white) exhibit a DeltaE (2000) of over 10. 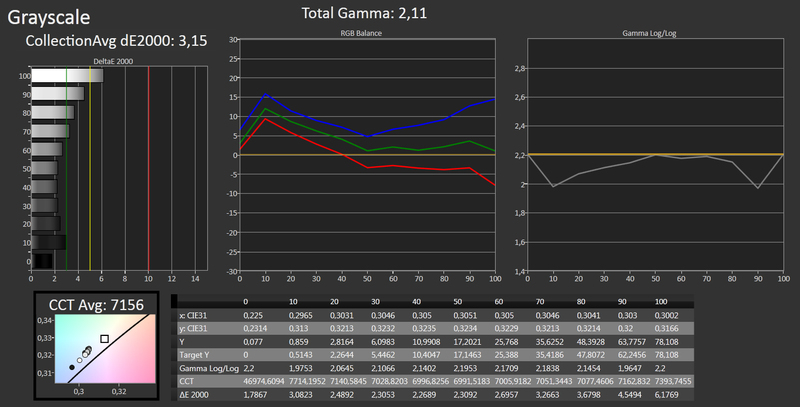 The average gamma rate of 2.48 is too high (ideal: 2.2). The peak value of 2.7 is reached at 90% white. Striking: The white point is clearly shifted into the blue range with 8461 K (too cold). 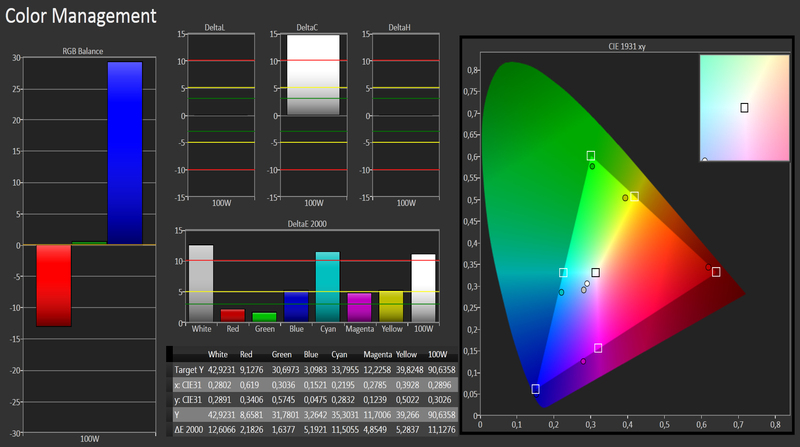 The color gamut measurements exhibited a color triangle slightly shifted towards blue with extreme white deviations (DeltaE 11.1) and cyan (DeltaE 11.5). 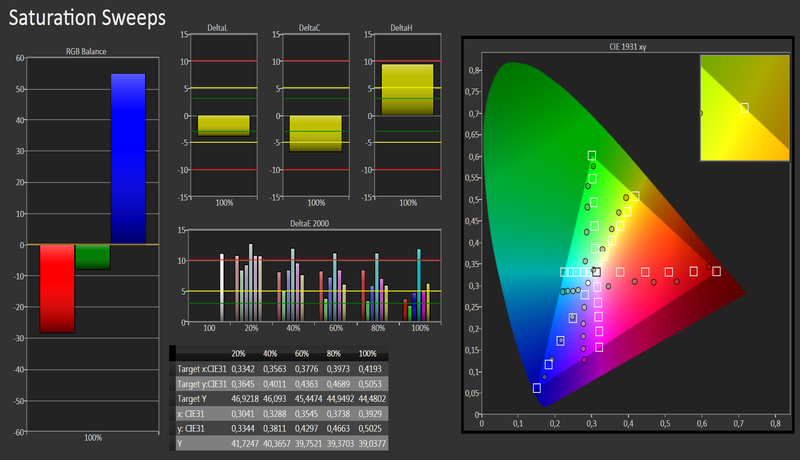 A closer look at the color saturation shows that cyan exhibits high deviations over the entire range. The other colors particularly show weaknesses in low saturation levels and close in on a DeltaE (2000) of around/below 5 at 100% saturation. In a direct comparison, Lenovo's ThinkPad X220 with an IPS screen exhibits much lower DeltaE rates regarding the grayscale but a more accurate gamma curve ascertained in the factory-set screen profile. The white point of 7393 K is also still too cool (ideal 6500), but it is much better than in the X1 Carbon. The ascertained color gamut exhibits the biggest deviations in blue and magenta. 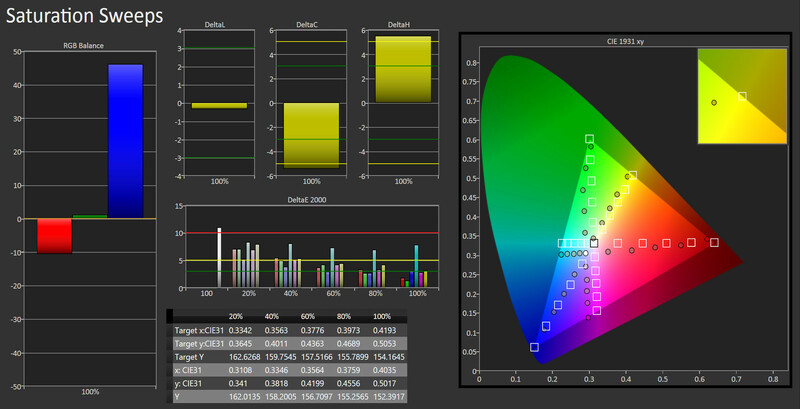 The X220's IPS screen shows a high fidelity with the biggest deviations at 100% saturation in the saturation assessment. 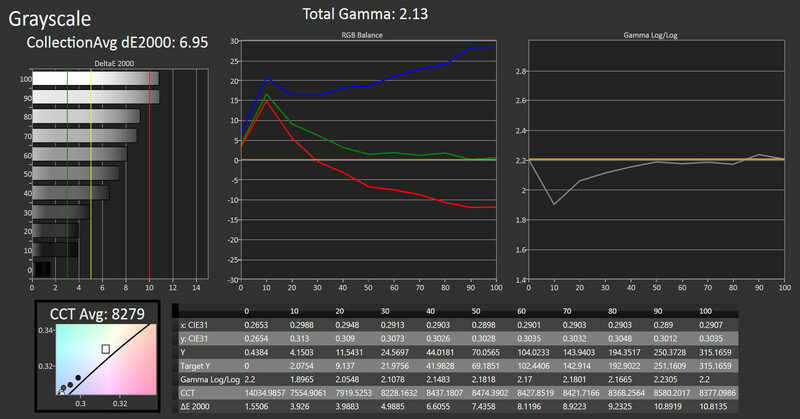 We measured the screen in the X1 Carbon in a calibrated state (i1 Pro 2) again. The grayscale could be improved significantly in both DeltaE and in the gamma value compared with the delivery state, just like the cyan and white deviation. This also applies to the saturation, whereby each level could be reduced to below a DeltaE of 10. However, the screen is also deprived of the ideal maximum deviation of DeltaE 2-3. Regarding the offered viewing angle stability, the installed TN Panel provides a high standard for this technology. Compared with low-cost TN screens, as found in Fujitsu's U772, the ThinkPad X1 Carbon is clearly superior. However, the screen cannot quite match an IPS screen, as used in Lenovo's ThinkPad X230 or Asus' Zenbook UX31A. 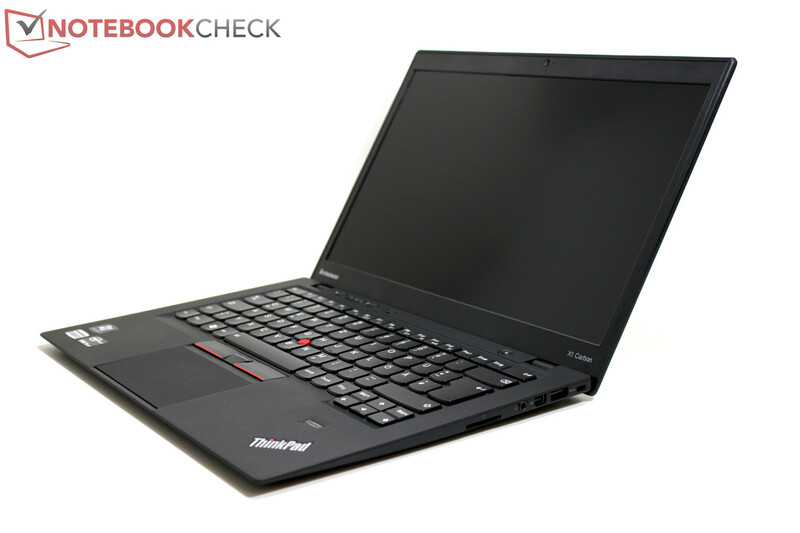 In a direct comparison, the X1 Carbon shows clear image changes especially when looking down on the screen, whereas the X220 only exhibits a minor brightness reduction while maintaining accurate colors. At the time of the review, our test sample configured with Intel's i5-3427U ULV processor including the integrated Intel HD 4000 graphics solution, 8 GB of RAM and a 128 GB solid state drive was listed at 1449 Euros (~$1873) and the cheapest model in German online shops. Upgrades are available for the CPU (i7-3667U tested in our first X1 Carbon sample) or the installed storage device (180 or 256 GB SSD). Depending on the desired equipment, the purchase price quickly increases by several hundred Euros and can even easily surpass 2000 Euros (~$2585). The i5-3427U ULV CPU enables Intel's AMT and VPro functions, is based on two native cores built in 22 nanometers (Ivy Bridge) and supports Hyperthreading as well as Turbo Boost 2.0. The CPU could be clocked up to 2.8 GHz on one core providing that there are enough cooling reserves. 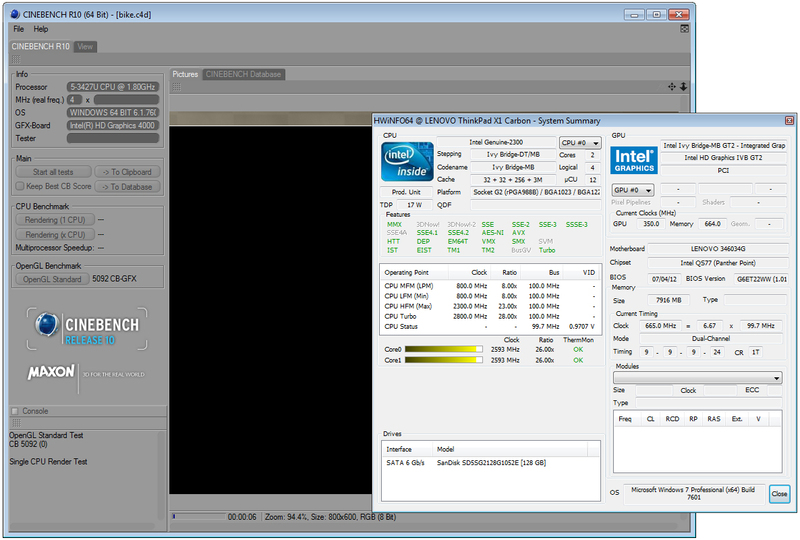 We observed a maximum clock frequency of 2.6 GHz when one core was loaded in the Cinebench R10 single-thread test. 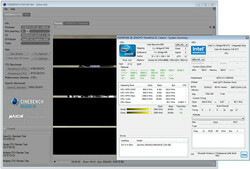 The chip achieved Intel's specifications when both cores were loaded and also clocked with up to 2.6 GHz. For comparison, we recorded a maximum clock of 3 GHz in the previously tested X1 Carbon model featuring an i7-3667U CPU (cf 2000 - 3200 MHz acc. to Intel's specs). A look at the benchmarks in detail shows that the score of 4748 points in the Cinebench R10 single-thread test are on a par with the same chip in Fujitsu's U772. Apple's MacBook Air 13 (2012) only has a slight lead with 4828 points. 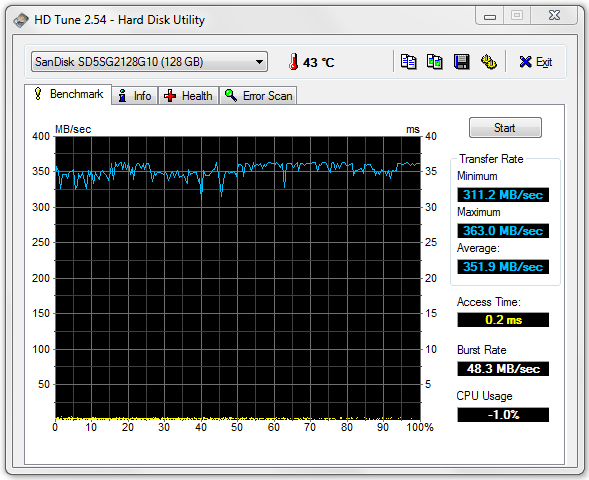 The alternate i7-3667U CPU in the correspondingly equipped and tested X1 Carbon has a lead of 13%. 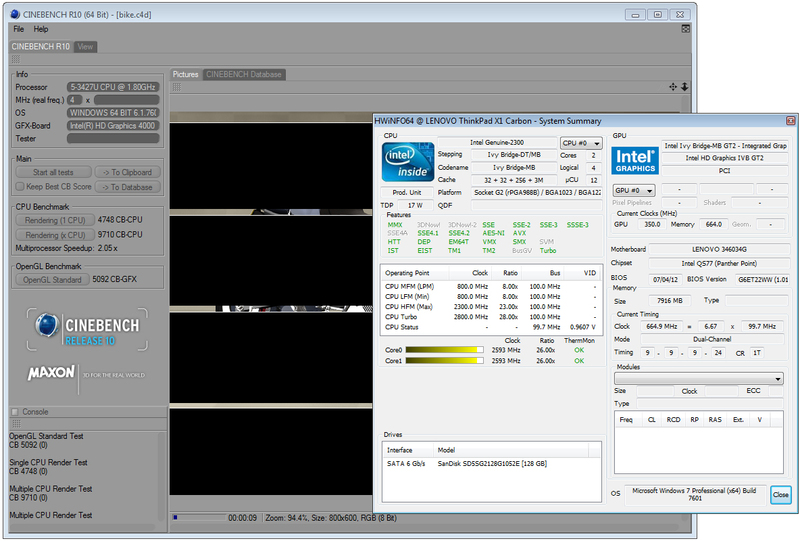 Lenovo's X1 can outdo the aforementioned devices slightly in the Cinebench R10 multithread test. The other i7 chip outperforms its i5 counterpart in the present test device by a whole 17%. The performance ratio is similar in the newer Cinebench R11.5. The i7 CPU can excel the smaller unit from the i5 range by 13% in the CPU test. The present test device reaped in 15.5 fps in the OpenGL test and places itself right between the MacBook Air 13 and Fujitsu's U772, which use the same CPU. Interesting: Our US test sample featuring an i7-3667U processor clearly lags behind by roughly 30%. Both the CPU's and GPU's full performance is available on battery power. The corresponding tests in the Cinebench R11.5 benchmark exhibited virtually the same scores as in AC mode. The well-known PCMark benchmark test provides a method for analyzing the system's overall performance. Our test system accomplished a good 11738 points in the Vantage test. 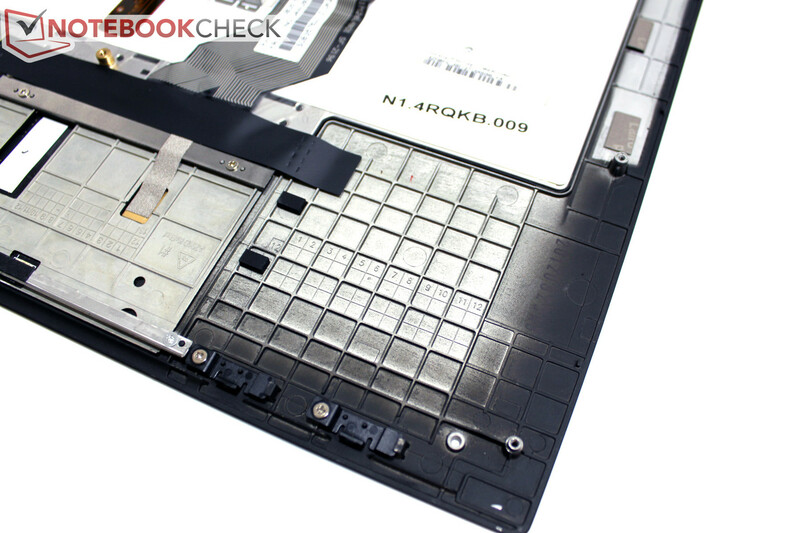 Fujitsu's LifeBook U772 only lags behind slightly with 11577 points. A remarkable advantage of the faster i7 CPU is not really obvious in this benchmark. 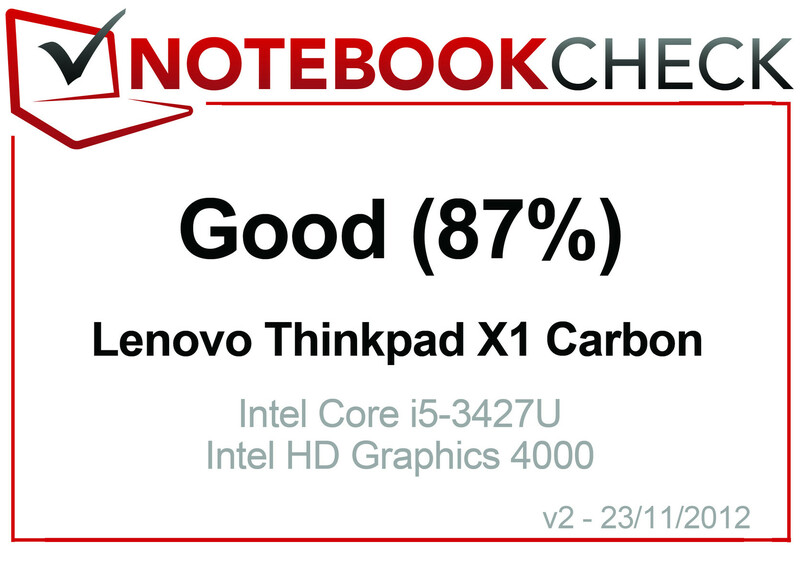 The i7 model in the ThinkPad X1 Carbon only has an insignificant lead of approximately 3%. 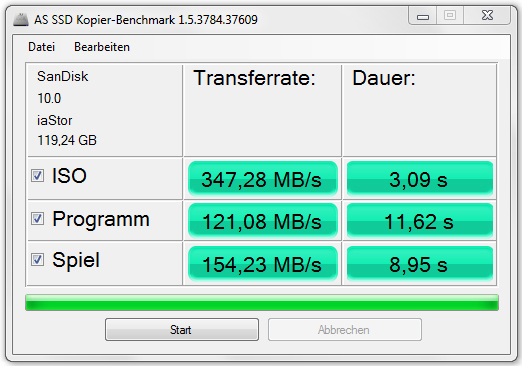 A somewhat more apparent difference is seen in the storage device's sub score. 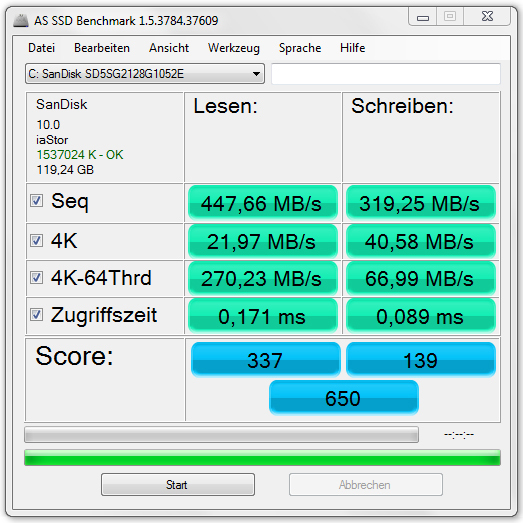 Our test device with the 128 GB Sandisk solution (SD5SG2128G10) lags roughly 15% behind the tested US version which sports a 256 GB SSD (SanDisk SD5SG2256G1052E). 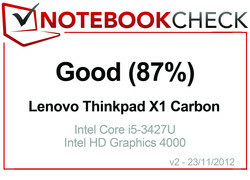 Lenovo's ThinkPad X1 Carbon with the i5 CPU achieved 5129 points in the latest PCMark 7 and is on a par with Fujitsu's U772. The US model's score is again unusual: Despite the faster CPU, it falls behind a bit with 4888 points. A possible explanation could be the mere 4 GB of working memory that was used in this configuration. Three different storage solutions are currently available in the models offered in Germany. A solid state drive with a gross capacity of 128, 180 or 256 gigabytes depending on the configuration is used in all cases. In the CrystalDiskMark benchmark, the 256 GB alternative in the US model supplied sequential read and write speeds of over 400 MB/s and 28 MB/s respectively and 46 MB/s (read/write) in 4K data blocks. 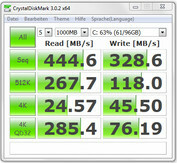 The 128 GB SSD installed in our test model accomplished similar rates, but remained slightly behind the 256 GB unit in sequential read (328 vs. 415 MB/s). 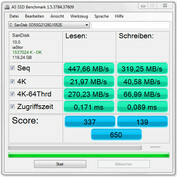 The Micron Real C400 (128 GB) in Fujitsu's LifeBook U772 is clearly surpassed with 194 MB/s in the sequential write test, while the other results are on about the same level. The CPU-integrated HD Graphics 4000 covers the basic requirements placed on a graphics chip. Office and Internet tasks are no problem, but certain graphics-heavy applications, such as CAD, graphic design, etc. might cause a performance bottleneck. 3211 Points in 3DMark Vantage places the ThinkPad X1 Carbon right between ultrabook colleagues and notebooks from the consumer and business sector (ULV and standard-voltage), which are also equipped with Intel's HD 4000 graphics solution. Fujitsu's U772 also stays far back with 2225 points (-30%) and the US i7-3667U CPU model that we tested also remains below our expectations with only 2437 points (-24%). One explanation could again be the larger memory capacity of our test device. Another possibility would be that the drivers have been updated since the launch of the X1 Carbon. Should up-to-date computer games belong to your intended field of use, you will have to count on playing them using limited graphics quality and reduced resolutions in the best case. Heavyweights, such as Battlefield 3, completely refuse to run on the integrated graphics solution. Details about which games run on Intel's graphics can be found on our Intel HD Graphics 4000 technical page. High performance, low noise - impossible? 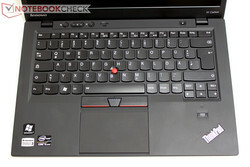 Depending on what you consider high performance, Lenovo's ThinkPad X1 Carbon does a good job in office scenarios. Our configuration of the X1 Carbon remained virtually silent during low power consumption scenarios (MS Office applications, Internet, etc.). We only recorded a slightly higher level of 31.9 dB (A) during load and in the more realistic mix via 3DMark 2006, as well as during the stress test (CPU and GPU loaded). Short performance peaks can boost the fan to similar rates for a moment in routine use. However, the fan decreases its speed very fast and possible distractions are kept within limits due to its muffled hum noise characteristic. 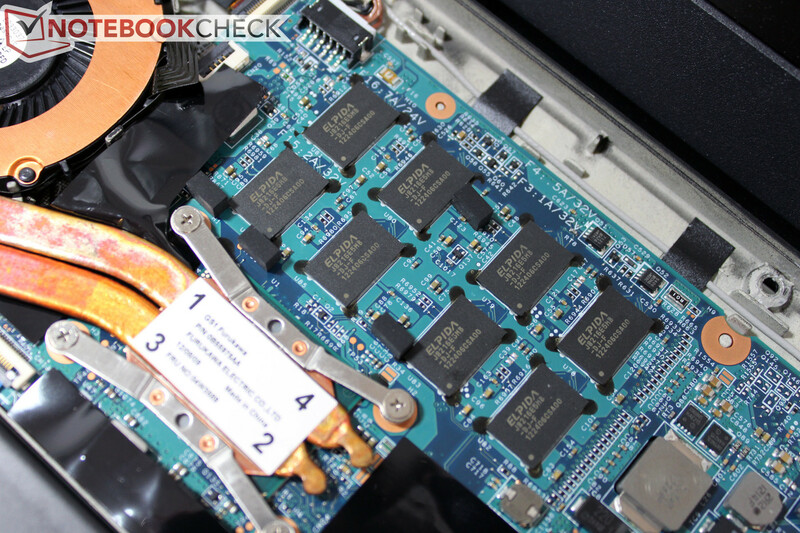 We occasionally heard a quiet "clacking" noise when the fan was active in our test device. Our test device exhibited pleasant temperatures with peaks of approximately 30 °C (86 °F) on the base unit's top and approximately 32 °C (89.6 °F) on the bottom in use without load. The surface temperatures were a bit higher with 32 and 35 °C (89.6 and 95.0 °F) during Internet browsing. Thus a noticeable temperature increase will likely be noticed depending on the application scenario and ambient temperatures when using the device on the lap. We first induced critical maximum temperatures of up to 52 °C (125.6 °F) on the base unit's top and high 55 °C (131 °F) on the bottom in the stress test. Although this will unlikely be reproduced in practical use, the limits of an extremely slim base unit in conjunction with a high-performance CPU become obvious. In the same test setup, the reviewed US model featuring Intel's Core i7 CPU exhibited extremes of 35.6 (96.1 °F) on the base unit's top and 38.8 °C (101.8 °F) on the bottom in idle. The peaks reached high 52, respectively 53.6 °C (125.6 and 128.5 °F) during load (stress test). However, the measurements took place in a summer-like temperature of 27 °C (80.6 °F) and should be viewed with caution when compared directly. 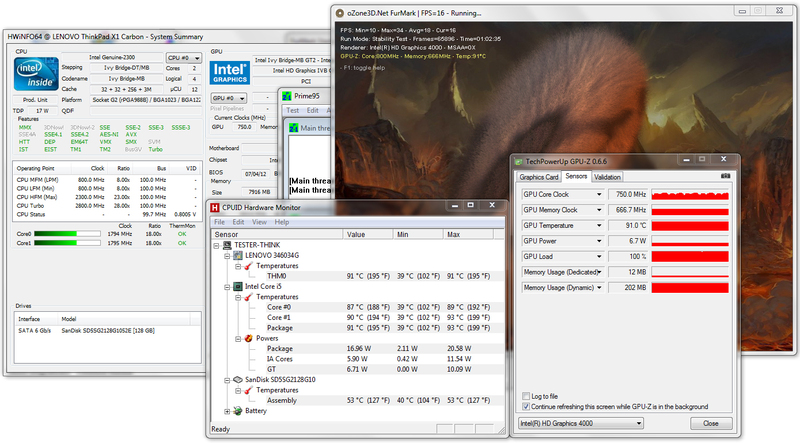 The CPU started with around 2.6 GHz in the stress test (FurMark & Prime95) and settled to its default clock of 1.8 GHz after a while. In return, the HD Graphics 4000 fluctuated between 650 and 800 MHz. The processor's core temperatures increased up to 93 °C (199.4 °F) in this extreme load scenario and remained stable at this level. Consequently, CPU throttling was not an issue even in the demanding stress test. (-) The average temperature for the upper side under maximal load is 41 °C / 106 F, compared to the average of 30.7 °C / 87 F for the devices in the class Subnotebook. (-) The maximum temperature on the upper side is 52.4 °C / 126 F, compared to the average of 35.8 °C / 96 F, ranging from 22 to 57 °C for the class Subnotebook. According to Lenovo, the highest-quality speakers from the ThinkPad family are built into the ThinkPad X1 Carbon. "Full surround sound for audio conferencing, music and media with Dolby Home Theater 4" is read just as wholeheartedly in the device's spec sheet. In a nutshell, the music tracks from various genres played in the test did not convince. The Dolby software makes the rendered sound a bit more tolerable, but the low volume and lack of substance remains below expectations and does not convince even in a direct comparison with other ultrabooks of this size. We measured a minimum power consumption of a mere 3.4 Watts in (nearly) ideal conditions. Here, we used the lowest brightness level of 1, Windows' energy-saving profile and disabled the Wi-Fi module. 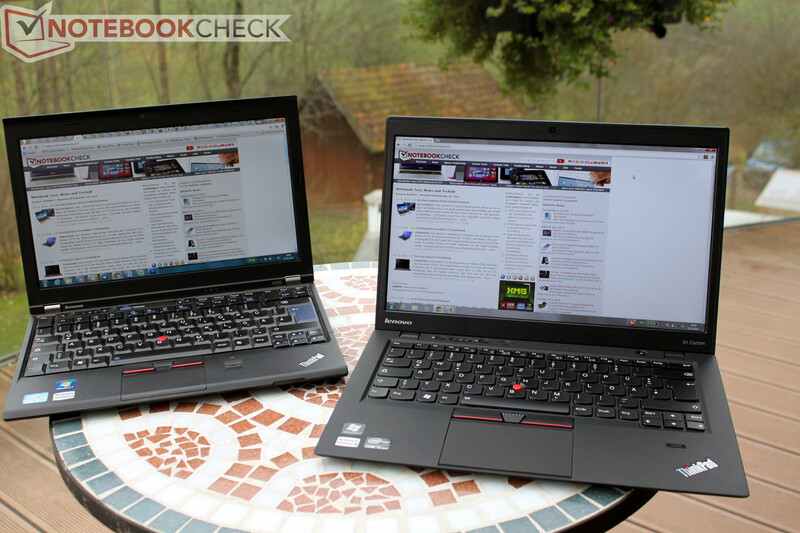 The X1 Carbon is in an exemplary position next to the competition. The next in line is, for example, Asus' UX21A with 4.1 Watts or the UX31A with still very low 4.4 Watts in comparable settings. 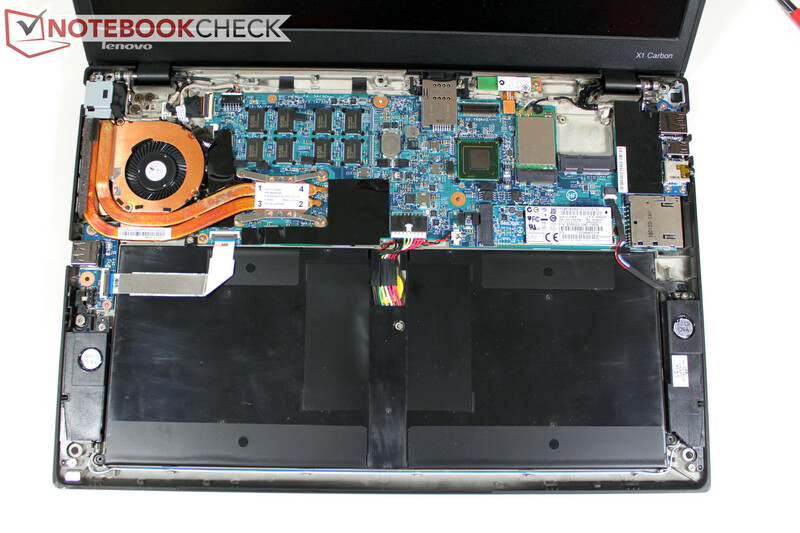 Fujitsu's U772 ultrabook is also found here with a minimum of 4.4 to 8.7 Watts (min/max idle). The X1 Carbon's somewhat higher idle maximum of 9.8 Watts in maximum brightness is likely primarily due to the much brighter screen. Fujitsu's U772 can only answer with approx. 200 cd/m² in this point. 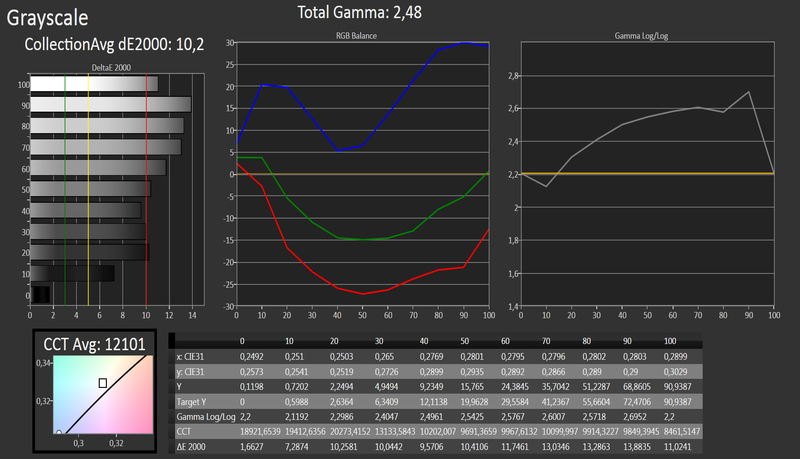 The X1 Carbon and the U772 are virtually on a par with 32.5 to 38.7 Watts during load. For comparison: Lenovo's compact ThinkPad X220 contender, which however uses standard-voltage components (2520M) and a 12.5-inch IPS screen, consumes 5.7 to 10.5 Watts in idle and 40.1 to 65.1 Watts during load. Regrettably, we do not have comparable data for the latest X230 (Ivy Bridge), but it should be on a similar level depending on the selected configuration. Lenovo builds a 45 Wh battery into the ThinkPad X1 Carbon. For comparison: Fujitsu installs an equally big battery in its U772 business ultrabook and HP relies on a 52 Wh model for its EliteBook 9470m. Dell's upcoming Latitude 6430u will have to cope with 36 Wh according to first information. We recorded 536 minutes, so approx. 9 hours, in the test for determining the present configuration's maximum possible battery runtime using the Battery Eater Reader's test tool and minimum-draw settings (screen brightness level 1, Windows' energy-saving profile). In the "worst case scenario", i.e. during load with maximum brightness and Windows' high-performance profile, the ThinkPad X1 Carbon lasted for merely 86 minutes in the Battery Eater Classic test. We achieved a runtime of 367 minutes, or roughly 6 hours, in the practical Wi-Fi test using a brightness setting of approx. 150 cd/m² and the energy-saving profile. Websites opened automatically every 40 seconds including a flash video share of about 10%. That is a clear gain compared with our earlier US test configuration. The different CPU, RAM and SSD configuration might be responsible for the deviations to some extent. However, a halving or doubling of the battery runtime can only be explained by an error in our first test system, which was a very early test model provided directly by Lenovo. The drained 45 Wh battery is recharged amazingly fast. The battery capacity is refilled to 80% just after about 35 minutes and it is fully recharged after merely 73 minutes. Even short recharging periods, for example at the airport or at meetings, can increase the mobility of Lenovo's ThinkPad X1 Carbon significantly. 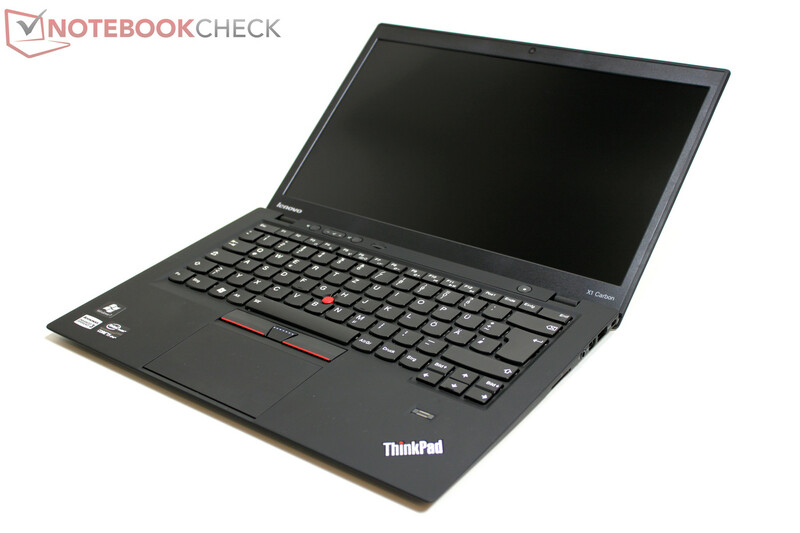 It is almost inevitable that you will come across Lenovo's ThinkPad X1 Carbon when looking for an ultra-portable office laptop with business features. The bundle sounds perfect: 1.3 kilograms (~2.87 pounds), bright and matte 14-inch screen, vPro compatible hardware, low emissions, and long battery life. Although finding possible shortcomings or points of criticism was not easy, there are a few. Minor workmanship flaws contradict the X1's high quality claim; the limited connectivity, in particular the lack of a docking port, could be a source of annoyance for certain user groups. The possible high casing temperature or the display's screen door effect should not lead to restrictions in routine use. The screen scores with high brightness, good contrast and consequently perfect outdoor-use suitability. Owners of an X220 or X230 with an IPS screen can nevertheless stay relaxed. The screen installed in the X1 Carbon does not achieve the IPS-typical viewing angle stability, though it is better than mainstream TNs. Moreover, weaknesses in color analysis, particularly in the reproduction of gray hues, are noticed. One of the major points of complaint in our first review of the early US model of Lenovo's ThinkPad X1 Carbon was the mediocre battery life. In this review the laptop presented itself, though in a different configuration, much more compelling. Either Lenovo has improved the software in the meantime, or our first test device from an early production batch still had corresponding hardware problems. Compared with Fujitsu's U772, also a 14-inch business ultrabook, the ThinkPad X1 Carbon is superior already because of its brighter screen. However, Fujitsu is not worried about that because it relies on the highly competitive price. The U772 is available starting at approximately 1000 Euros (~$1318) (i5-3317U, 4GB RAM, 128 GB SSD), which is still a whole 500 (~$387) less than Lenovo demands for its entry-level model. The comparison with the recently launched HP EliteBook Folio 9470m (review coming soon) is interesting. 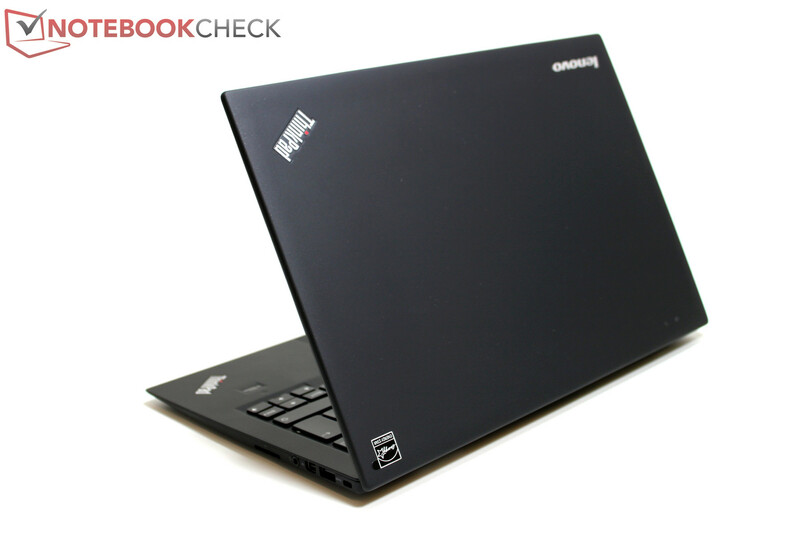 A bit less expensive than the X1 Carbon, this business ultrabook aims at the same clientele as the X1 Carbon. Dell also wants to join in and places its Latitude 6430u at the starting line. We will however have to wait and see the Latitude's price position and ultimately also the detailed results of our review that will follow as soon as the laptop is available.